Less Than Jake is an American ska punk band from Gainesville, Florida. Originally formed in 1992 as a power pop trio, the band evolved into a hybrid of ska punk. 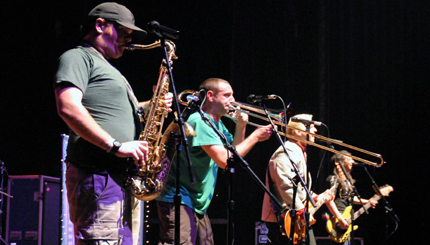 Less Than Jake have also been cited as showing influences from a wide variety of genres including post-grunge, heavy metal, alternative rock, third wave ska, punk pop and punk revival. To date, the group has released eight full-length studio albums and a number of singles and compilations. The current lineup comprises guitarist/vocalist Chris Demakes, bassist/vocalist Roger Manganelli, drummer/lyricist Vinnie Fiorello, trombonist Buddy Schaub and saxophonist Peter "JR" Wasilewski. On June 24, 2008 the band released their latest studio album, GNV FLA, on their own label Sleep It Off Records.